Is it a mistake to go for the 70,000 point Delta AMEX GOLD card? First let me say, no matter what other bloggers may think, 70,000 Delta Skymiles for getting a credit card is a great deal. Toss in $100 credit for spending on Delta, and at a MINIMUM you are getting $800 in value for getting the card. Now there are things that trouble me about this deal. The main one is what could happen to you. I applied for and was approved for the SPG business card in July. My math was bad (I hate it when I do that) and it was 3 weeks too soon thus, since the new rule with AMEX is that you must not have had that TYPE of card for the past 12 months, I got ZERO bonus points. When I activated the card I was assured YES I would get the points. When I called back to ask to bump the bonus to 30k (I applied for the 25k), I was give the 5k bonus points to match the 30k offer and was assured yes I would get the full 30k. Then, the first statement hit. No points. Was told NO I would not get the points and I worked all the contacts I know and got a firm NO. Could everyone approved for this deal, not only NOT get 70k but get ZIP, ZERO, NADA points? It could happen, not saying it will, but it could. Another big problem of why I would not go for this deal, (I could since it has now been 12 months since I had the consumer type Delta AMEX), is due to what you have to do to get it. Some are saying all we are doing is tinkering, massaging, adjusting the “code” to get the deal. AMEX is honoring the deal (we will see), but here is the risk. 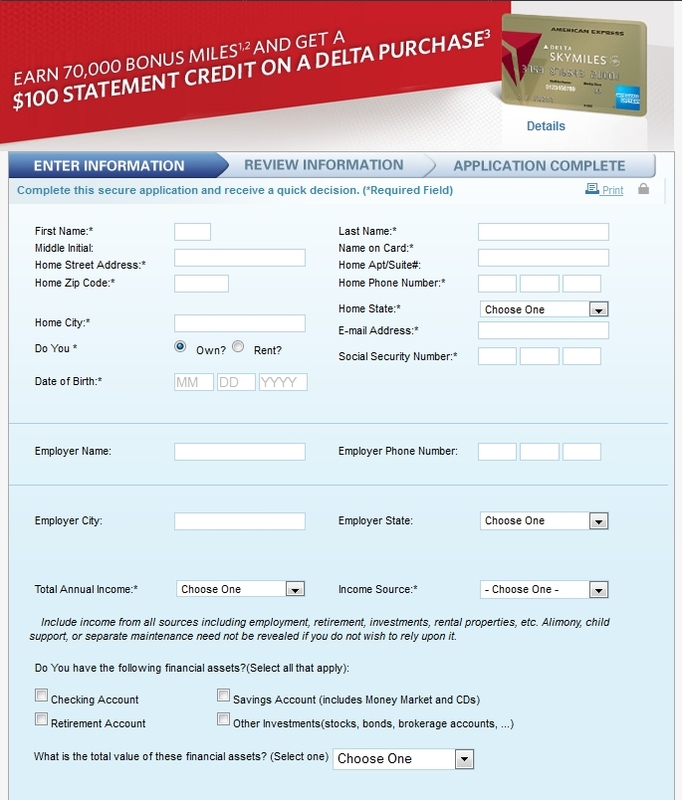 By knowingly manipulating the code to get the deal, might AMEX decide you are not someone they want to do business with? Or, could they decide to hit you with the dreaded Financial Review process since you have already shown yourself as one willing to “bend” the rules to get the bonus? Who knows. The main reason, for those of us who want MQM’s, getting the personal, any personal DELTA AMEX, per the T&C, will invalidate you from getting the new card bonus for another DELTA AMEX personal card. So you are missing out on the chance to pick up 10,000 MQM’s before the end of the year for getting the personal Reserve card. That is what I plan to do for my next round in October. I plan to with that card, and flight, and spend on my current business Reserve card roll-over just under 50,000 MQM’s needing only 25k more to stay Platinum Medallion until FEB2015! I think a lot of us that applied dont care for MQM. I have a question: I already have a personal Delta gold AMEX card. Can I get this 70,000 point deal on another Delta Amex card by getting it as a business card instead? @Montana – no sorry. You can get the biz card from my link but it is NOT the 70k offer. I applied for the wife, who doesn’t have a need for MQMs and has never had a prior DL card. If she gets the full miles it will nicely top off her balance though. And the free bag, etc will help for when she is flying without me and my lowly Gold status. Like anything else, it depends on your needs and patterns. As Mike said, too, many folks don’t have many other new cards to go for anyway, so why not? The minimum spend need not divert much from actual purchases if you work some creativity into it. I will take 70,000 Delta miles any day. Delta miles are great to use for international business/first class awards. If i am not the primary account holder but an additional cardholder for another delta amex card does that mean that I have had a Delta Amex? I was not able to earn any bonus/MQMs as an additional cardholder so my guess is no, but does anyone know for sure? Is it true you can use your delta miles at 1c each to purchase flights as well? Is this where the minimum $700 value comes from? @CodeAdam10 – you got it 100% right. If you have the card you can do that. BUT, know you will NOT earn miles when you do this. OK! Thank you for answering my question about the business card!